We take pride in the fact that more than 90% of our produce is grown here at Sanitas. One of our goals has always been to sell Botswana-grown plants and produce. We have always promoted indigenous and water wise plants combined with water wise growing methods. We grow the largest selection of indigenous and water wise plants in Botswana. 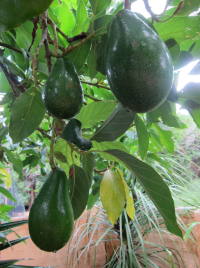 We however also grow exotic fruit trees and garden plants as well as a wide variety of pot plants. Sanitas grows the largest range of succulents as well as large specimen trees and palms. We primarily propagate our plant stock from cuttings and seed. We grow more than 500 species of plants of numerous varieties. Our plants are grown under Botswana conditions to be able to thrive in our sometimes very harsh climate. We also grow a selection of cut flowers & greens that are used by our in-house florist. We even grow our own vegetables, fruit and herbs for our kitchen at the Tea Garden and for retail. We grow a wide variety of flower, vegetable and herb seedlings in season. We offer a large selection of indigenous and exotic trees. 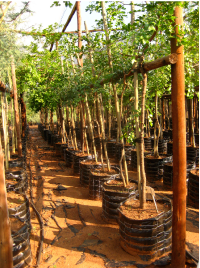 We also supply large trees in 100L / 200L wire baskets. These trees are normally already 2.5 – 3.5 m tall and ideal for an instant affect. These are polular with landscapers. Citrus, mango, litchi, avocado, stone fruit like peaches and nectarines. Paw-paw , banana, pomegranate and grapes are usually also available. We have a nice selection of the most popular palms like: Washington fan palm, Wild date palm, Queen palm, Pygmy date palm, Date palm and several more.The Palms come in al sizes from small to extra large, supplied ex-ground. 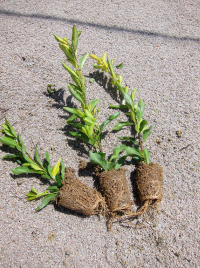 Planting lawn plugs is an easy and cost effective way to establish a lawn. L.M. and Buffalo lawn are suitable for semi-shaded areas wheras Cynodon and Kikuyu need full sun to thrive. Cyndon varieties are the most water wise of the lawn varieties. Daisy Lawn does well in semi-shade to sunny areas. We are in the process of yet again upgrading and improving our irrigation systems. Energy smart pump stations are to be installed that will supply our water wise drip irrigation. Rain water is also collected using different methods. At Sanitas we take recycling seriously. Paper, cardboard, cans, glass is all recycled. No organic material is ever wasted, it all get processed in one of our many composts. The compost is then blended into our different plant growing mediums.